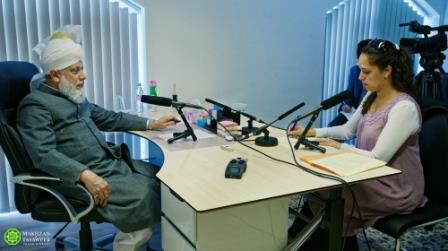 On 10 May 2016, the World Head of the Ahmadiyya Muslim Community, the Fifth Khalifa (Caliph), His Holiness, Hazrat Mirza Masroor Ahmad was interviewed by Denmark’s Radio 24syv (Radio 24Seven). “Our slogan of ‘Love for All, Hatred for None’ is based on the teachings of Islam because the Holy Quran says that people should love and care for each other and respect one another. The Quran says that you should be just and fair even with those who oppose you. Thus, Ahmadi Muslims are sympathetic and compassionate towards all of mankind.”His Holiness also spoke about the increasing instability in the world and reiterated the need for mankind to recognise their Creator and for people to fulfil the rights of each other. Share the post "Ahmadi Muslims sympathetic to all of mankind – Head of Ahmadiyya Muslim Community"